Charge!!! And by charge we mean shuffle meeples across the board fighting circles of cardboard in the game that is Crusaders: Thy Will be done by Seth Jaffee and TMG. Trust us when we say, it is much more exciting than we made it sound. 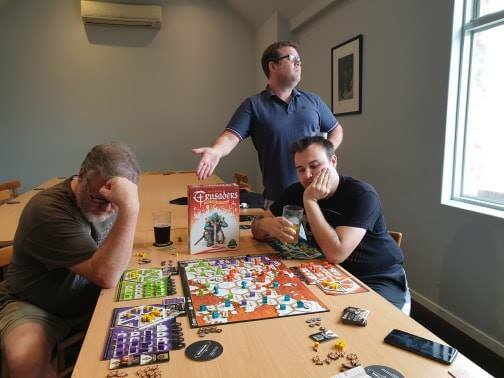 After a great chat about Crusaders, Mark provides us with a long overdue Kickstarter update which features Aussie games as well as global ones so get your wallets ready! And finally, the clock is ticking so get your BorderCon entries in soon! The competition closes at the end of March so stop whatever you are doing AND ENTER!! !